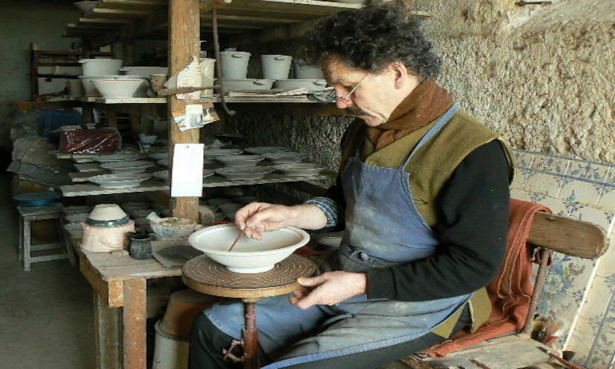 Andrew McGarva has been making pots at La Tuilerie in France since 1990. Born in Scotland, he worked in England with famed potters Mick and Sheila Casson before moving with his wife and partner Clare and their children to live in rural France around the turn of the century. The family settled in the Nièvre, a rural area steeped in the local stoneware pottery tradition, where Andrew still buys his stoneware clay. 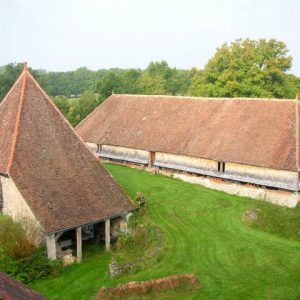 The Nièvre is the most western part of Burgundy and La Tuilerie farmhouse that the McGarva family occupy is built of and on local limestone and clay. According to their biography, the McGarvas have an idyllic existence in an 18th century tile works surrounded by organically farmed land set next to a forest. The drying building is a stellar example of local timber frame building styles. The oak from the forest and the clay for the tiles from the ground all around. The old kiln with its pyramidal roof is now their shop. The workshops are in the old farm barn. Andrew throws on a traditional flower pot-makers’ wheel from England. 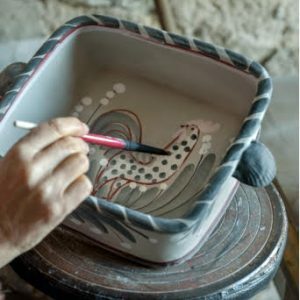 Once the pots are dried and biscuit-fired, the decoration is painted directly on to the unfired glaze. The two work in tandem. Andrew paints the outline and Clare does the coloring. The original inspiration for the decoration came from historical 18th century English delftware but the pieces are modern enough to weather both the dishwasher and the traditional oven. The McGarvas hand-throw and hand-paint each of their pieces. Their land, farmyard, and the local wildlife provide the subject matter. We recently emailed the McGarvas a few questions to learn more about their work. Clare handled the correspondence and Andrew wrote the answers. SHED: What draws you to older styles and motifs? We’re thinking particularly of the medieval-style tiles and 18th century slipware. What is it about those motifs or techniques that you find interesting to continue? ANDREW MCGARVA: At art school we were encouraged to draw inspiration from history, [and] I see medieval tiles and 18-century slipware dishes as the highlights of English pottery. Living in an old tile works with red clay on site, I had the opportunity to make my own version of historic ceramics which I have always admired. The painted stoneware was originally inspired by English delftware but has continuously developed over the years into our own style. Making it in stoneware gives a more practical product for cooking and eating. It even goes in the dishwasher! English delftware makers were copying the Chinese export porcelains but made low-fired tin-glazed pots, many were exported to the Americas. We have added another layer to the story by making stoneware pots with blue and white painting that reflect the history and the countryside around us in our life today. SHED: Your work is extremely hand-intensive, with pieces hand-painted and one-of-a-kind. Why is that an important element for you and what satisfaction do you derive from it? MCGARVA: We live in industrial society where things are made by machines. Making and using things made by hand is a different choice. People can choose to use a piece of usable and affordable art. SHED: In the fine arts, we talk about “process pieces,” work that is imbued and given importance in part because of the work that went into creating it. Is that part of what you are making with your pottery? MCGARVA: Tricky question! You don’t get the end result without the process. In a way, the customer is buying a reflection of the maker’s personality. It is satisfactory to make something usable from start to finish. This entry was posted in Meet the Makers and tagged ceramics, France.